The cost to play a card can vary a lot, but just as important is the fact that individual decks have significantly different access to resources. For example, a traditional Leadership deck gives you several opportunities to get more resources (such as the awesome Steward of Gondor attachment and the traits of Théodred and Glóin) and to re-allocate resources (e.g. the Parting Gifts attachment from the A Journey to Rhosgobel Adventure Pack). On the other hand, I have often found myself playing Lore decks with great high-cost cards on my hand, but never enough resources to get them in play. The situation gets worse if and when you need to use Glorfindel‘s resources to heal damage. Those rounds you have only 2 resource tokens to play with. Thus, be mindful of how many high-cost cards you include in your deck and adjust the amount to the specific traits of the deck. Most Leadership decks can stomach a high ratio of expensive cards, whereas Lore-only decks should focus on a large amount of inexpensive cards, so that the player does not get stuck and cannot heal for several turns while saving resources just to get an ally in play. I love Haldir of Lórien (from the A Journey to Rhosgobel Adventure Pack) and Gildor Inglorion (from the Hills of Emyn Muils Adventure Pack), but I will leave most of them when playing Lore-decks in the future. One of the main reasons I bought this game was for the solo play, but as much fun as it was it’s rarely satisfying to be trounced every time you play. And then I started playing two-handed (two decks). Since then I’ve found that scenarios are less impossible (you can take advantage of characters who are ranged or sentinals), the difficulty is more balanced (treachery and shadow cards often discriminate between the first and second player), and you get to see how cards from different decks interact with each other (I’m looking at you Lore). It’s much more fun for me and, to boot, I learn how to play a better 2-player game. Leadership sphere has some very key cards in it’s sphere, one of them being Sneak Attack which is one of the top 3 Events in the game. I currently run Prince Imrahil in my Spirit/Rohan deck to great success. Imrahil because his ability keys off nicely with all the Rohan allies who leave play and by having Leadership in the deck, it allows me to play Sneak Attack and Steward of Gondor. Steward of Gondor usually ends up on one of the Spirit Heroes while Imrahil’s Leadership resources are used to sneak attack Gandalf, Faramir, or Eomund. Dropping Gandalf for 1 resource really needs no explanation as to how good that is. (his ability lets you draw 3, lower threat by 5, or do 4 wounds to one enemy when he comes into play… all for 1 resource is huge! ), Faramir’s Will boosting ability is great when you suddenly have a large stack of cards in the staging area, and to be able to drop him for 1 is helpful. With Gandalf costing 5 and Faramir costing 4, those are expensive allies that require a bit of banking of resources, sneak attacking them allows for quick uses of their abilities almost as if they were event cards. Eomund is another character that Sneak Attack works well on in a Rohan deck since you can Sneak Attack him, quest with him then when he disappears all your other Rohirrim ready just in time for the combat phase. I’m missing some of the Kazad-dun adventure packs and the core set, so I haven’t seen if Sneak Attack synergizes with any other Leadership/Spirit allies yet, but if they do, I’ll be sure to post an updated gametip. 🙂 Until next time, have fun questing! When assembling your party, whether it’s looking at constructing a single deck or when choosing which combination of decks to play, be mindful of the mix of your party. I haven’t played solo, so I’m not sure what to do there, but in co-op, it’s been useful for my group to think in terms of RPG or MMO party mixtures. You need someone to tank, buff, heal, etc. These can be individual decks focused on a single sphere or a variety of mixed sphere decks (particularly when you get the Songs from the first expansion cycle). It is possible to beat some of the easier scenarios with a weak party, but it doesn’t take too much of a difficulty increase before you’ll find out that a party with significant gaps (no Tactics heroes, for example) is going to get smacked down pretty quickly. Most of the time when I play CCGs, eventually after playing for a while I wind up focusing strictly on game mechanic. There could basically be white cards with mechanic text and that’s it, no pictures, no flavor text, no title, no art and I wouldn’t even notice. I’ve observed that a lot with gamers and ccgs over my 10+ years of card gaming. With Lord of the Rings I try to take a different approach and allow myself to get caught up in the setting. So when my group plays, I turn on the stereo and pop in one of the Lord of the Rings soundtrack CDs (or pull up the playlist on youtube, or start up iTunes, etc). While playing I take the time to read the card titles and sometimes the flavor text, instead of, for example, just paying 3 resources and saying “I’m lowering my threat by 6” when playing The Galadhrim’s Greeting. The music really draws you into the Tolkien’verse and I feel it’s enriched my gaming experience while playing this great game. It’s really made the game that much better for me and I hope it enhances it for you as well, but as always, YMMV! Enjoy! I’ve tryed this decks and so far so good they are handling all quests. Would you like to try it? During your first couple of games I recommend not using Shadow Cards. With will makes your quest much easier and you’ll be able to get the basics of the game down without getting destroyed by the minions of evil on your first few turns. The box says the contents are enough for 2 players, but that’s just not true. There are only two threat counters in the box, but if you count the thread using pen and paper (or even two 10-sided dice) you can play with up to four! Sure, there are not enough cards for proper deck building but if each player takes all cards from one sphere you can try it out and see if you like it before buying extra stuff for the game. Undefended attacks by monsters can be rather disastrous, especially when a nasty Shadow effect is added to the attack. So, it’s a rather automatic response to make sure all attacks are defended. However, sometimes it can be beneficial not to defend against an attack so that you have one more character that can strike back. The (undefended) attack will deal more damage, but you’ll get rid of the Enemy sooner, so in the long run, you’ll sustain less damage. This approach can be especially useful if you can assign the damage to a hero such as Gimli or Gloin, for whom the damage triggers some positive effect. Furthermore, if you have some way to predict or cancel the Shadow effect, you can prevent this approach from backfiring. But even if you cannot control the Shadow effect, sometimes it’s worth it (and neccessary) to take the risk. This probably seems like common sense, but with all of the things to keep track of in this game, I often see people neglect to pay attention for unique cards (identified by the symbol next to the card name). Only one of these can be in play at a time, and having more than one would often lead to broken interactions, such as the tip further below that suggests having Steward of Gondor attached to two different heroes (it’s a unique attachment, so that’s a no-go) which would allow for the generation of a ridiculous amount of resources and make the game too easy. It’s such a plain, unexciting symbol, it can be easy to overlook, but keep an eye out for it so that you don’t break the game and can get maximum enjoyment out of it. This game is very difficult played solo unless you’re an accomplished deck constructor. I am not one of those people, in fact this is my first game of this type. I was reliably beat by this game in my first many solo games as I played single-sphere, out of the box decks. I do like a challenge but this was beginning to sour my taste for the game. Then I tried playing “two-handed” (or “two-fisted”, i.e. as if two players). This did incredible things for me in rekindling my enjoyment of the game. Without the need to construct multi-sphere decks I was now able to see the great interactions between the various spheres. Plus, it brought the game into the range of challenge where I can win (some of the time). So, if you’re playing solo and finding the game too tough, try playing with two hands and see if Middle-Earth isn’t habitable for you again. Be wary when building your deck that a common problem you’re likely to run into is Location card buildup in your staging area. This can be devastating if you get distracted with killing monsters and you can’t generate enough willpower to get past them. So ensure your decks have enough allies and events to deal with potential buildups (e.g., Northern Tracker and Strength of Will) or that you can generate massive amounts of willpower to punch through them. Legolas always comes in handy too. It is easy to be seduced by the power of the high cost cards. Cards that cost 4 or 5 should be limited to those cards which will help you execute your strategy. If you are to be seduced by a 5 cost card, Gandalf should be up there in the running. In the first few months of the game, he was a staple of every deck. The problem with these powerful cards is that they end up being a waste, sitting in your hand with not enough resources to play them. For these reasons, make sure to build your deck with a 0 cost card (if one fits your sphere), a couple of 1 cost cards, and a good number of 2 cost cards. The number of times it has even been difficult for me to play a 3 cost card, even one as awesome as Forest Snare leads me to believe, even 3 cost cards are often times too expensive. If it does not directly help your decks strategy, beware that cost. The exception to this is, of course, if you play a resource heavy Leadership deck. When you first play the game out of the box you’ll have four decks, one for each sphere. On their own these decks are passable, but a little weak, since each sphere focuses on one thing. You’ll be able to face stronger challenges when you start building your own decks. An easy starting point is to take the starting Lore (Blue) and Leadership (Purple) decks and just combine them. 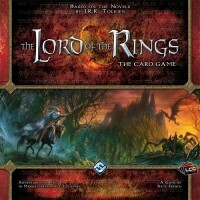 Choose any three heroes (I prefer Aragorn, Eowyn, and Theodred) with at least one from each sphere and start playing. After each adventure, remove cards from your deck that you’re not finding useful. Soon you’ll have a great deck capable of facing many challenges. Below are four deck lists that you can build out of two Core Sets. They’re each fifty cards and they should provide compelling gameplay for four players and a lot of variety for a solo player or a pair of players. Slap Self-Preservation on Gloin and you’ll be a defensive beast. Getting Steward of Gondor on Aragorn usually means good things. The theme here is pumping up your heroes to an incredible level. Unexpected Courage on Beravor is probably the single best two card combo in the game. This deck gives you a great chance of pulling it off. In all quests, even the less enemy heavy quests, a bad early game enemy draw could net you the loss of a key hero. Try to get an ally out early to use for a sacrifice. Even if some allies don’t look very useful, if they cost just 1 resource or 2 in some cases, they can be useful just to give you that early survival defense. In just about any constructed deck, having 1 ally that costs just 1 resource can be valuable no matter what their abilities are. Allow the party to concurrently explore an additional location with 3-4 players. Instead of allowing the active player to pick only one location at a time to travel to, we allow the heroes to explore 2 active locations concurrently. The effects of both locations are active simultaneously. When the players successfully quest, the active player may distribute any progress tokens among any of the active locations. Progress tokens may still be placed on the main quest only when there are no active locations. Most of the game’s mechanics scale very well when adding more then 2 players. However, time and time again we have found ourselves losing because the location cards pile up faster then we are able to clear them. Obviously there are ways to clear these extra locations (ie Northern Tracker), but if you are only looking at how many can be cleared by questing it gets more difficult to keep up each time you add another player. The game loses some appeal when the Northern Tracker becomes the ONLY strategy. This variant allows the heroes to clear more then 1 location a turn if they are willing to commit enough willpower to the cause. One of the great things about this rule, is that it doesn’t break the feel of the game. It actually makes perfect sense with a party of 12+ heroes (Fellowship of the Ring) that they would split up to deal with threats as needed. Boromir can handle nearly all of your battling needs all by himself. Combine Boromir with Support of the Eagles and a Winged Guardian or Vassal of the Windlord for a truly devastating effect. If you can get a Eagles of the Misty Mountains out by turn 3 or 4, you can make your attack and defense strategy exceptionally powerful. Cards like Born Aloft and Meneldor’s Flight can help save the Vassal and Guardian until you have time to play the Misty Mountain Eagles. If this ideal situation comes up, the boost to Misty Mountain Eagles will help both Boromir and those eagles. The Horn of Gondor aids this play and pick up strategy with the early eagles by cutting down on their cost significantly. Frodo may be one of the most powerful characters released so far. When I first saw him in the initial pack, I knew there was the possibility that he could become a game changer. A general premise follows the decision on Frodo. His ability changes some of the mechanics of the game. With the addition of the Song of Mocking card, he now gives you the ability to save heroes from death or damage in exchange for some threat. There is never a game I can think of where having Frodo soak some damage as threat for Eowyn has not been a quest saving move. Also, with the addition of Fast Hitch, he becomes a very powerful blocker. The fact that he can never die until you reach 50 threat means that you can put any attachments you want on him and there is no worry about him dying before they are useful.